Life is Hard? Wear a Tutu! Does this tutu make my bottom look big?! At God’s Pocket Dive Resort on my 50th birthday. Go ahead – mock me! 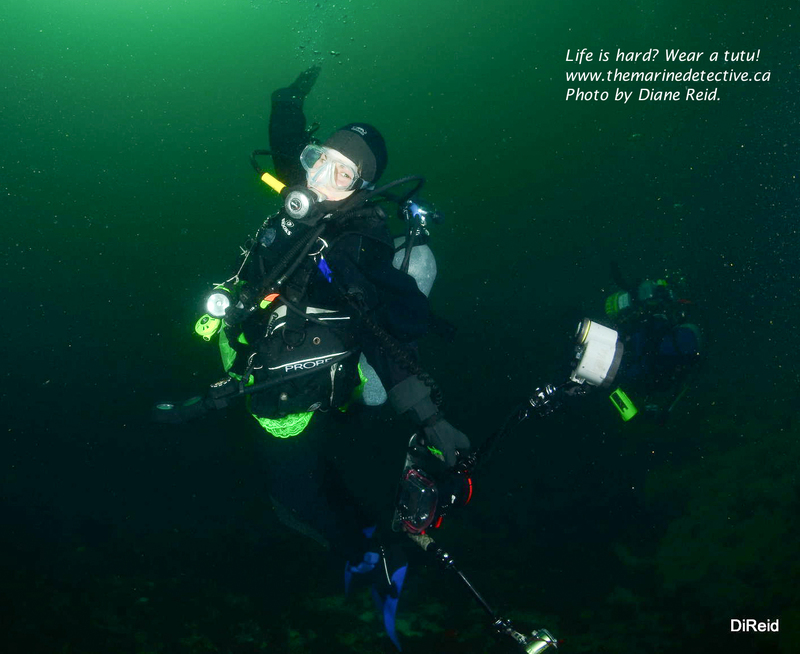 I now often wear a tutu when I go diving. It’s a flamboyant, neon green tutu. Hum, maybe “flamboyant” as an adjective for “tutu” is unnecessary – but I digress. 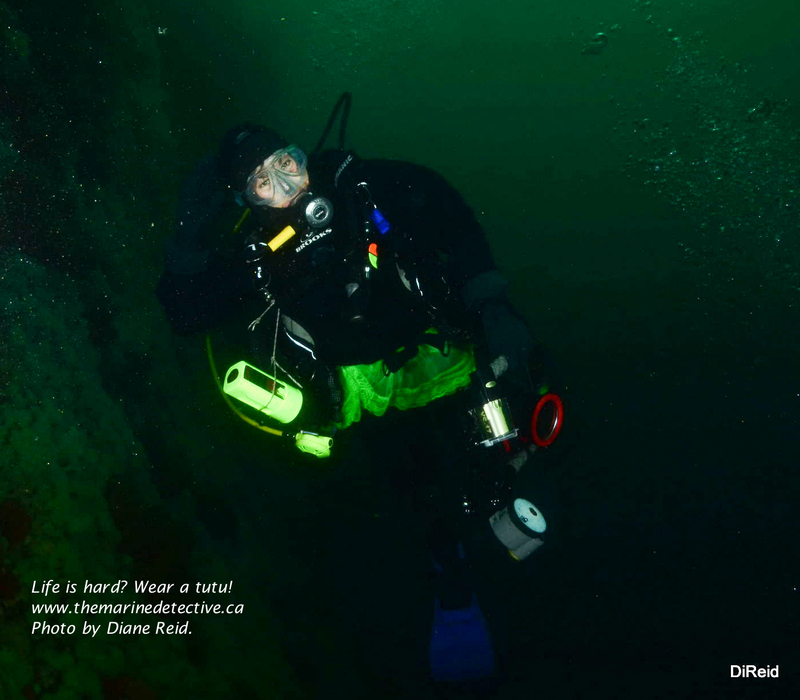 I first wore my neon green tutu over my dry suit while diving on my 50th birthday. It delights me that my birthday happens to coincide with Earth Day but oops – again I digress. Wearing the tutu was to celebrate all that life has brought me, especially how cold water diving in this beautiful, beautiful place has shaped my life. It clearly also makes a statement about my believing you can never be too green – or too flamboyant! Sincerely, it also has proven to have value for safety as it makes me much easier to see in a dark underwater world of black neoprene clad divers. Underwater poser! Photo by Diane Reid. But more than that, I wear a tutu because, for all of us, life is sometimes hard. What the wisdom gained from these 50 years has taught me is that through it all – the sinking to the depths, the surfacing for air, the need for buddies, the loss of buddies, the weight of it all, the being adrift – it is more important than anything else to listen to your inner 8-year-old. I can hear her now. She’s loud – wanting to know when we are next going diving, loving the wonder and sense of discovery that submerging brings. She reminds me always of how my actions impact life around me and she voraciously loves to learn. She’s bossy and wants, as soon as possible, to share what she has learned about living things with others, hoping they’ll care as much as she does. She knows the importance of frivolity and lightness and to being ever true to what you feel. She loves wearing tutus and hopes to make people laugh by modelling the joy of being green. Life is hard? Wear a tutu! Great thanks to Diane Reid for the photo! Dive buddy Natasha Dickinson attempting to hide in the background. Super Mom! Up to 300 young under her care. Definitely need matching flippers…just to balance out the bottom weight issue. love it. Love the tutu Jackie – and God’s Pocket is one of my favourite places ever!! Happy 50th! a green tutu is so very practical. divers in black all look alike. i would have a better chance of finding my dive buddy if he/she wore a tutu. Perhaps a tiara would set that tutu off perfectly? Something with a little sparkle to attract things to photograph, LOL. 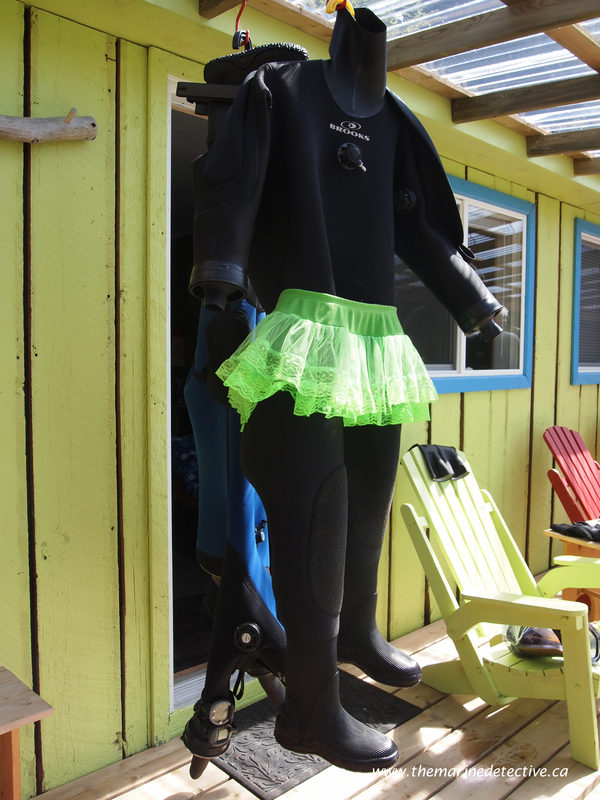 Well, we were diving at God’s Pocket the week after you, and the tutu definitely made for some fun conversation! Brilliant! What?! Fellow divers were talking about me behind my tutu? Glad it provided entertainment. Very best wishes to you Dan.